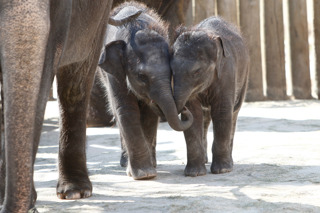 The Fort Worth Zoo is home to two elephant calves! Belle, daughter to Rasha, was born July 7, 2013, and Bowie (boo-ee), son to Bluebonnet, was born August 5, 2013. Bowie’s arrival made Rasha a grandmother and Belle an aunt – there are now three generations of elephants at the Fort Worth Zoo, which very much mimics how herds are established in the wild. 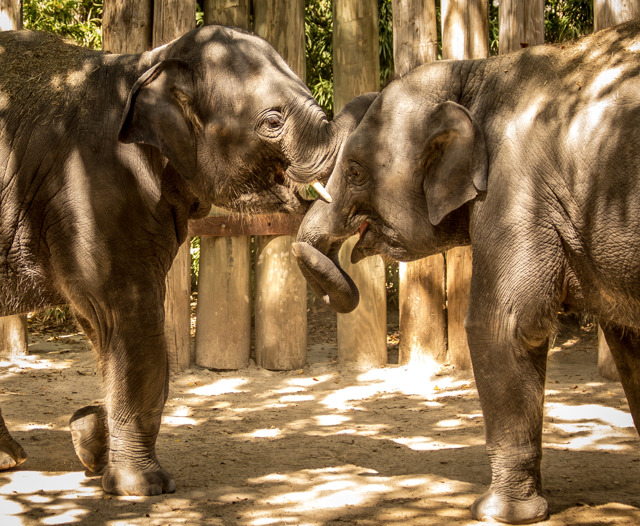 In total, the Zoo is home to seven Asian elephants: four females and three males. Belle and Bowie are turning five this summer! Just like any other four-year-old, Belle and Bowie spend their time learning, playing and growing. They may look small compared to the adults in the herd, but Belle and Bowie are growing fast! Belle currently stands a little taller at 6 feet 11 inches, while Bowie is not far behind at 6 feet 10.5 inches. Belle weighs in at 3,460 pounds, while Bowie is slightly heavier at 3,496 pounds. In their fourth year, the calves will continue with their behavior training and are expected to exhibit more independence from their mothers. Both calves swim in the pool on a regular basis and can be seen tossing tires around the exhibit. You might catch Bowie running through bubbles, a fun enrichment activity, or hear Belle letting everyone know it's almost closing time with a loud trumpeting roar. Around 6 months of age, Bowie began to show signs of tusk development, with ivory emerging through his gums. While they still have some growing to do, his tusks are now fully visible and are about 9 inches long. Only male Asian elephants have visible tusks; female Asian elephants have tushes, which are similar to tusks, but are shorter and stay hidden under the upper lip. Elephants use their tusks as a tool for digging or as a weapon during mating season. Similar to how humans are right-handed or left-handed, elephants will favor one tusk and use it dominantly over the other. Belle and Bowie’s arrival caught the attention of Mutual of Omaha’s Wild Kingdom, the popular Emmy Award-winning nature show that debuted in the 1960s. The show recently returned as a series of online webisodes and filmed at the Zoo for two days in May 2014, highlighting the Zoo’s three-generation elephant herd and the conservation work the Fort Worth Zoo does locally and abroad. You can watch the webisodes here. Your $40 symbolic adoption will contribute to baby Belle or Bowie’s care and feeding for one full year. Click here to adopt the baby elephants.